ded.bsetelangana.org D.EL.Ed First Year Exams Results 2017 : TS D.Ed/ D.El.Ed /TTC First Year Exam Dates 2017, Time Table, Hall Tickets, Results @bse.telangana.gov.in: #TS #D.Ed, #D.El.Ed Course Annual Exams 2017 Exam Fees, Time Table,Telangana/TS D.Ed,D.El.Ed Course Annual Exams 2017 Exam Fees,Time Table,Telangana D.ed D.El.Ed Course Annual Exams Exam Fees,Telangana D.El.Ed 1st year Examinations of 2015-17 batch will be conducted in the month of April 2017. Telanagana Diploma in Education First Year exams 2017 Time Table,Hall Tickets, Results, TS D.Ed First Year 2017 Hall Tickets, Exams Time Table for 2015-2017 Batch. BSE Telangana D.Ed 1st year Exams Time Table for Regular and Backlog Batch, TS DEd Second year Public/Special Exams 2017 Time Table, DEd 2nd Year Exams Dates, Hall Tickets of TS DEd 1st year TS D.Ed first Year Exams Time Table Download at www.bse.telangana.gov.in. TS BSE announced DEd 1st year Exam Schedule for 2015-2017 to be conducted in April 2017.. D.Ed first year, Second year students Download Hall Tickets at School Education Official website.TS D.Ed 1st Year Exam Dates 2017, Time Table, Hall Tickets, Results and more details are available here. 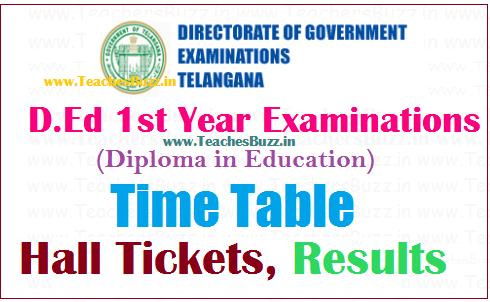 Telangana Director of Government Examinations Board has announced the D. Ed first year 2015-2017 batch Exam dates. D.Ed Colleges first year exams will be conducted in the month of April 2017 2017. These schedule is applicable to failed candidates in earlier D.Ed batches to appear these exams. The Board of Secondary Education AP officials had already informed to all the principals of D.Ed Colleges that first year exams will be conducted in the month of April 207. While communicating a copy of the time table for Special Examinations for D.Ed., 1st year scheduled to be conducted in the month of April 2017 from 9.00 A.M to 12.00 Noon. To take all necessary measures for conduct of the said Examinations. Steps shall be taken to give wide publicity to all concerned. OFFICE OF THE DIRECTOR OF GOVERNMENT EXAMINATIONS TELANGANA STATE: HYDERABAD :PRESS/ MEDIA NOTE : Rc. No 01/C1/TS/2017 :Dated: 01-04-2017. It is hereby informed that the following is the Time Table for D.EI.Ed.lst Year Examinations of 2015-17 batch and also for failed candidates of previous batches in Telangana State. 6 22-04-2017 (Saturday) 9-00 am to 12-00 Noon Paper – VI PEDAGOGY ACROSS CURRIC LUM AND ICT INTEGRATION. Candidates are advised to get D.Ed first year hall tickets from their DIET Colleges or private elementary teacher training institutes. And also can get the hall tickets from BSE TS web Portal http://bse.telangana.gov.in/ This hall ticket is the entry pass of the examination hall, So candidates must keep their hall ticket while you are going to the examination hall. It is hereby informed that the D.Ed., 1st year Examinations of 2015-2017 batch and also for failed candidates of previous batches will be conducted in all the districts in April 2017. Hall Tickets are dispatched to all the institutes in the state by speed post & will be hosted online. All arrangements have been made for smooth conduct of Examination and hence notified. Hence, D.Ed I Year Exams, April-2017 should be conducted as per same schedule. 6. Click on hall Tickets download. Telangana D.Ed 1st year exams of 2015-17 batch to be conducted from 17th April 2017. Hall Tickets Download link updated. you can also get your hall ticket from your D.Ed College. Fee Payment :The Examination fee is Rs.150/- for regular candidates. The fee has to be remitted separately for regular & once failed candidates through separate consolidated challans in the Government Treasury to the following Head of Account.